Words cannot describe this beauty of this yarn. Flurries is made with Australian merino wool and glass beads. 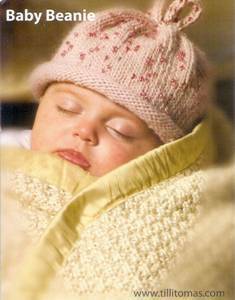 Try making this baby beanie with just one skein. Come and take a look at our sample in the Point Grey store – it’s just too cute! 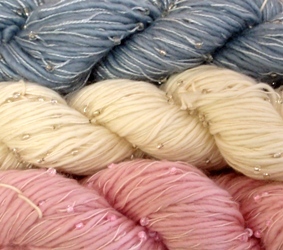 Another new yarn that we brought in from Tilli Tomas is Pure and Simple. 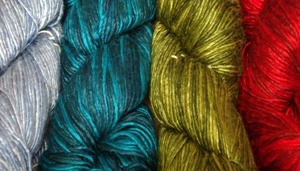 Made of 100% silk spun, this yarn has 260 yards – enough to make a scarf. Such rich and vibrant colours… come and take a look for your self! This entry was posted on Saturday, October 24th, 2009 at 3:20 pm	and is filed under Uncategorized. You can follow any responses to this entry through the RSS 2.0 feed. Both comments and pings are currently closed.